Following my last review in February 2017, I returned to the Cross Keys last night. This time I found it open. In fact, it was very difficult not to know it was open given the music blaring up the alleyway to the main street. The music outside in the alley was actually louder than it was inside. There are a couple of separate bars in this place. The smaller one is more traditional. But there is a larger second room where a musician started to set up whilst we were there. The barmaid was friendly and they do serve a real ale, which on this occasion was Betty Stogs. I also spied Weston's Scrumpy Cloudy Cider in a bottle of the fridge. So I indulged in that. A fairly grungy place. But with some character. 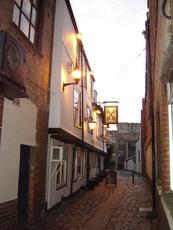 The Cross Keys is tucked away down an alleyway near the main shopping streets. I'd read that it closed on a Sunday daytime. So I was expecting a locked door. To my surprise it was open and there was music playing inside. Unfortunately it was just a musician practicing and the pub was indeed closed. Disappointing. I will hopefully return and find it open one day. Bit of an odd one this. Went in on a Monday evening. It was very dark, very noisy and the only beer they had on was a very strong porter. I can see how I might have liked it on another occasion, but I just wanted a pint of interesting session beer and a read of my book, so I moved on pretty quickly. As the picture shows, the pub is down a narrow side street beside Barclays bank. 2 changing beers from local brewers - yesterday from Cotswold and Prescott at �2.90. Friendly place worth finding. Nice everchanging real ales, good atmosphere, friendly service.